Sometimes all you need is a no-nonsense plan to make things happen. 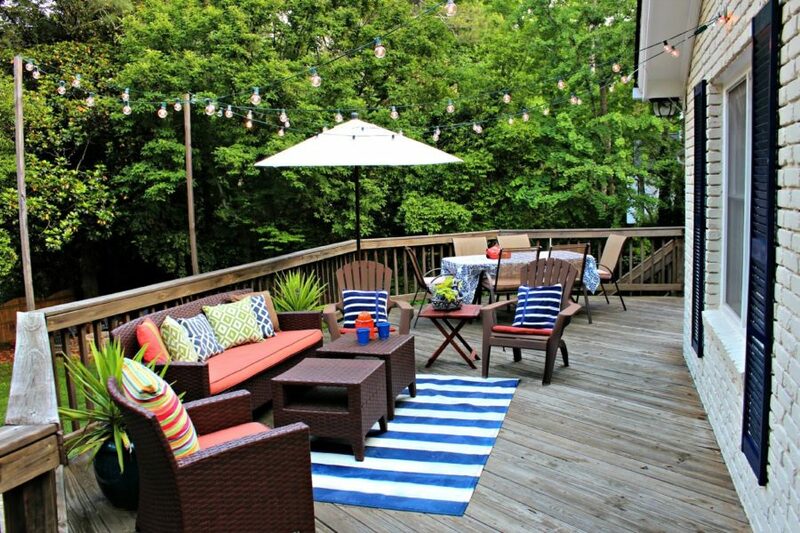 And if you’ve been struggling on what to do with your outdoor space, we’ve got you covered. 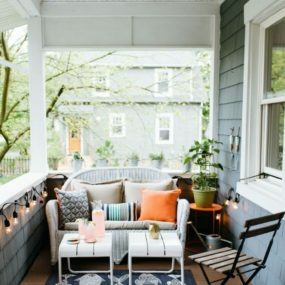 Here are 20 super simple back porch ideas that will have the area cleaned up and styled without any fuss or frustration. 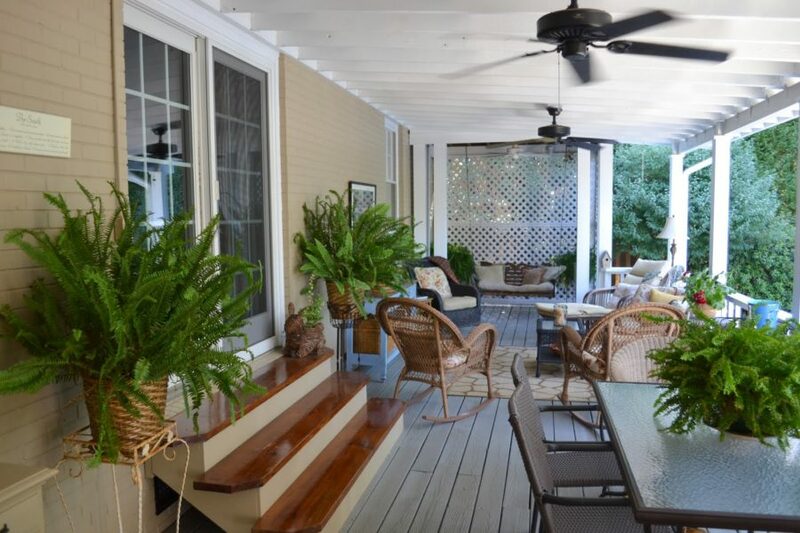 If you check out this YouTube video, you’ll be introduced to the most beautiful and relaxed back porch space. Perfect for families and evenings in the summertime, sometimes all you need is a crisp landscaping job and furniture that works for the outdoors but that’s plush enough to be comfortable too. And you get all of that in this home. If you’re looking for something equally as simple and easy but with a sprinkle of rusticism too, here’s a space to take a second look at. 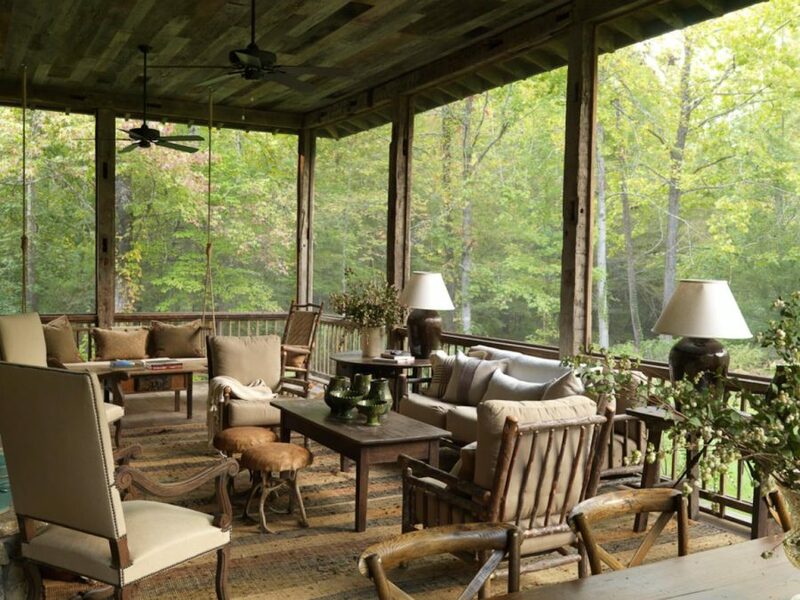 All wood everywhere and a pop of greenery in the corners, this back porch didn’t take much to put together but it does a lot for the covered area. Thanks for the inspiration HGTV! 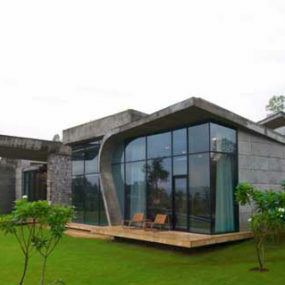 Designing Domestically knows that simplicity is key. 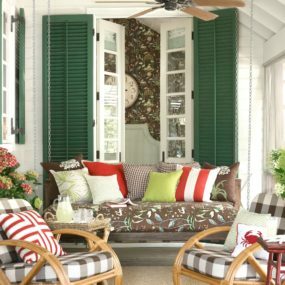 This quaint covered back porch has a delicacy about it that works well with furniture that includes more feminine lines. 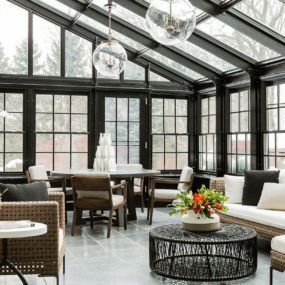 Wicker or slim legs, they’ll compliment this pretty space without overpowering its romance or girlish charm. The Handmade Home mixed up a funky combination of colors and furniture pieces. You get a personalized view of the family’s vibe by just peeking of this mix up. A place to sit and relax or a place to grab an evening bite, there’s something for everyone in this eclectic scene. Amy Spencer Interiors showcased this colorful contemporary scheme. Popping tones highlighted by black furniture, it’s a good mix of personality and traditional appeal. 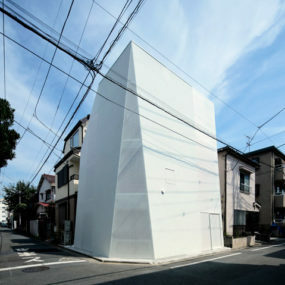 This space is covered but keep in mind this kind of styling can stand on its own outside as well. The black foundation works all year round and gives the versatility to change out colors and patterns within the changing of the seasons. Here’s another great example of how a little can go a long way. 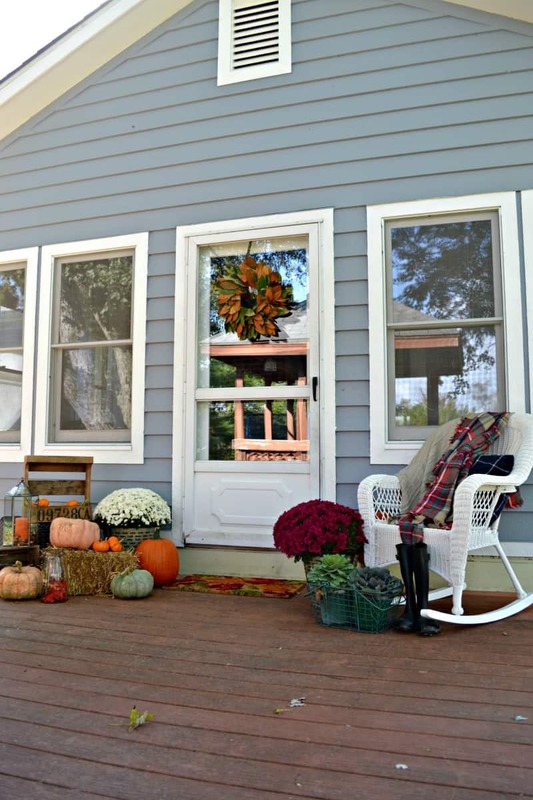 This back patio is perfectly styled for fall without too much coming out of the bank account or too much fun. Creatively Living provides us with a personalized design that’s doable for everyone and incredibly easy to replicate if inspired. If you’re more of a minimalist, here’s an idea for you! 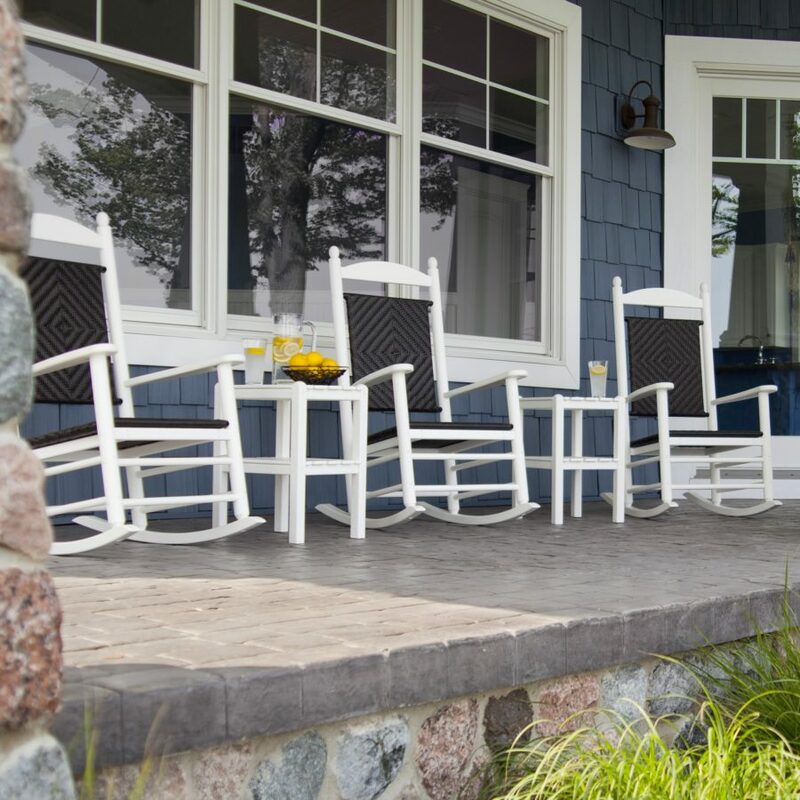 Simple gray and white rocking chairs lines up on the patio is really all you need. A side table or two to hold your iced tea along with the right amount of sunshine will certainly set off this easy style. 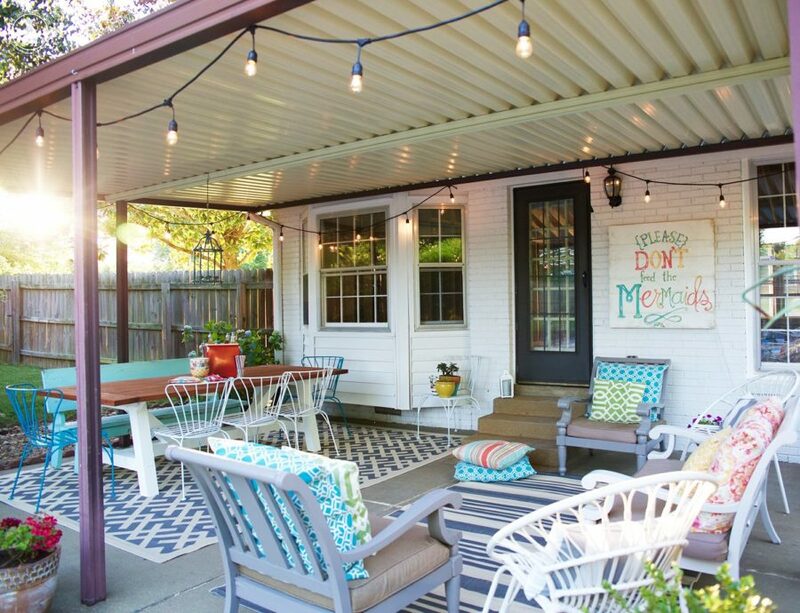 Here’s another covered patio idea that we’ve become inspired by. 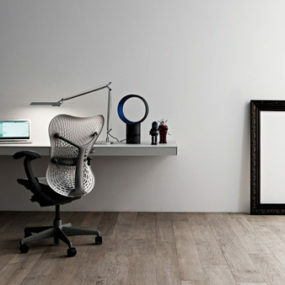 And because it’s a smaller space, it’s being utilized in all the right ways. A table with some seats is all you need to enjoy the area. 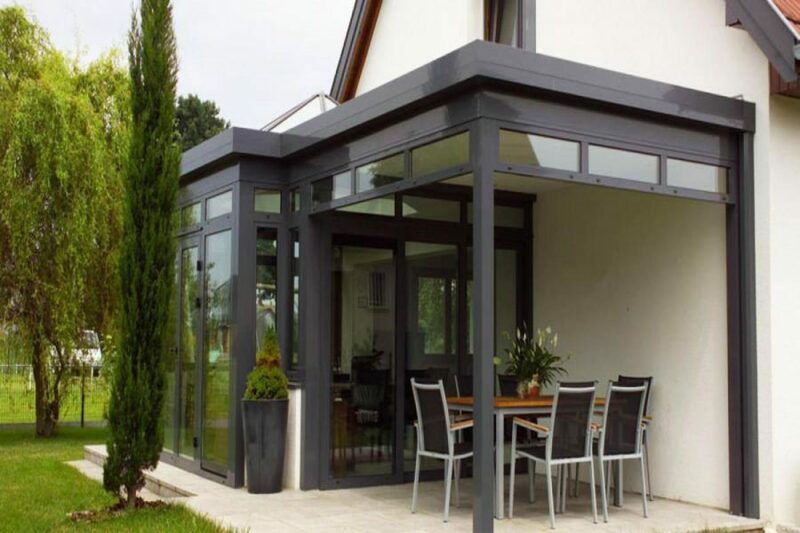 Summertime evenings or brunch on Sunday mornings can be spent right outside the door in the fresh air and sunshine. Garden Design has a lot of great ideas and inspiration, including this spread. 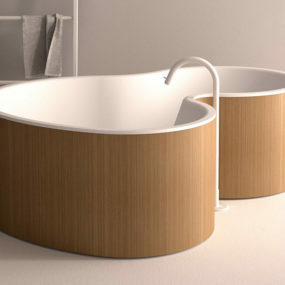 With its very Zen flavor and Tuscan-touched style, we instantly fell in love with the ease of the area. 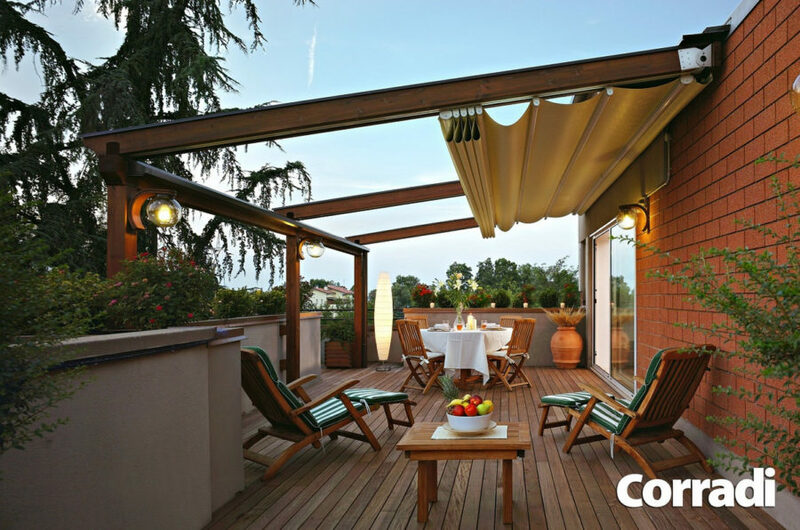 A rolling cover for when the weather takes hold, lounge chairs and a wood foundation, it’s got a natural vibe and a no-fuss feel. The greens accents enhance the organic essence that it seems to be creating as well. 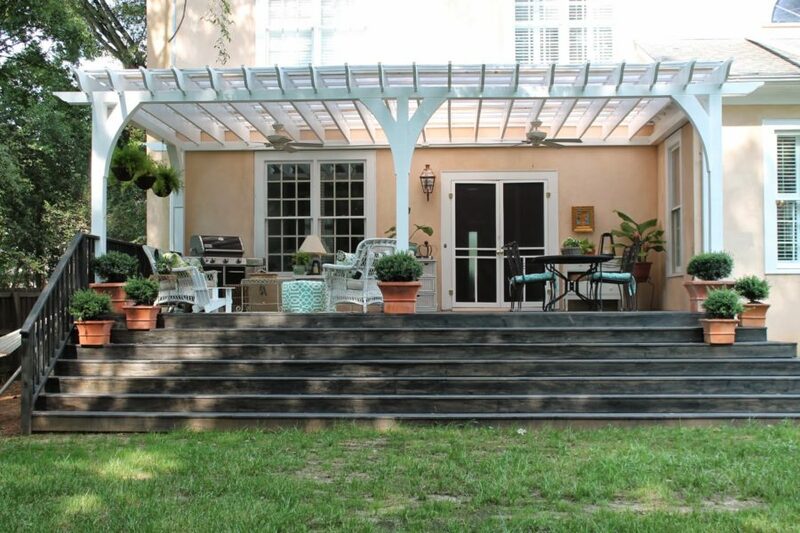 If you’ve got a wraparound porch and you have no clue what to do with all the space, have no fear! You don’t have to fill it all up with “stuff” or furniture pieces. 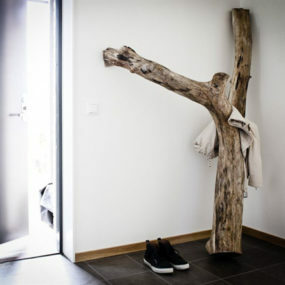 Instead, check out this easy idea from Interior Ideas. Metal or vintage benches, a few plants and cushions, that’s really all you need to create some outdoor comfort. World Market showcased a beautiful fall scape as well. 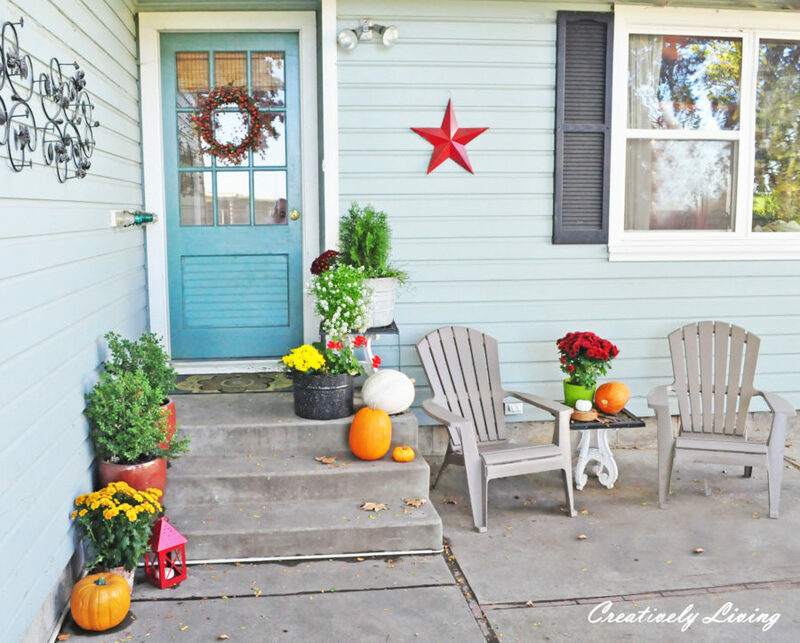 The wicker rocking chair is offset by autumn potted plants and pumpkins! It’s really that easy. 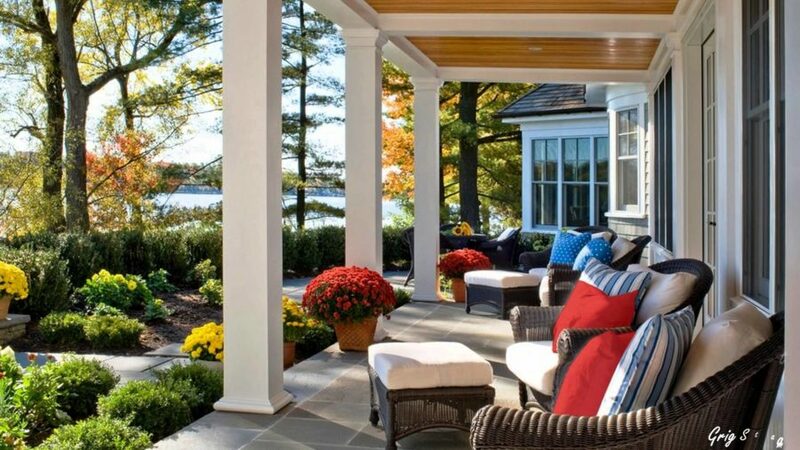 Just grab some things that are inspired by the season and refresh your patio with its presence. You don’t have to have it all filled up with “stuff,” instead, simplicity and homage the time of year works! 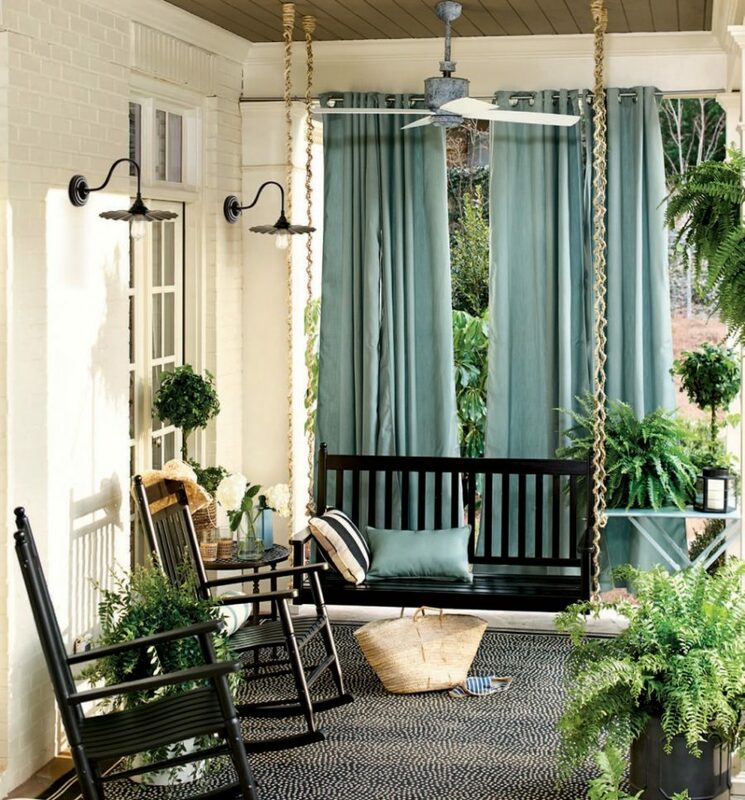 Adding a swing to the back porch mix seems like a good idea, don’t you think? Maison de Pax gave us the idea with this gorgeous set up! You can keep things simple but still add a bit of luxury. 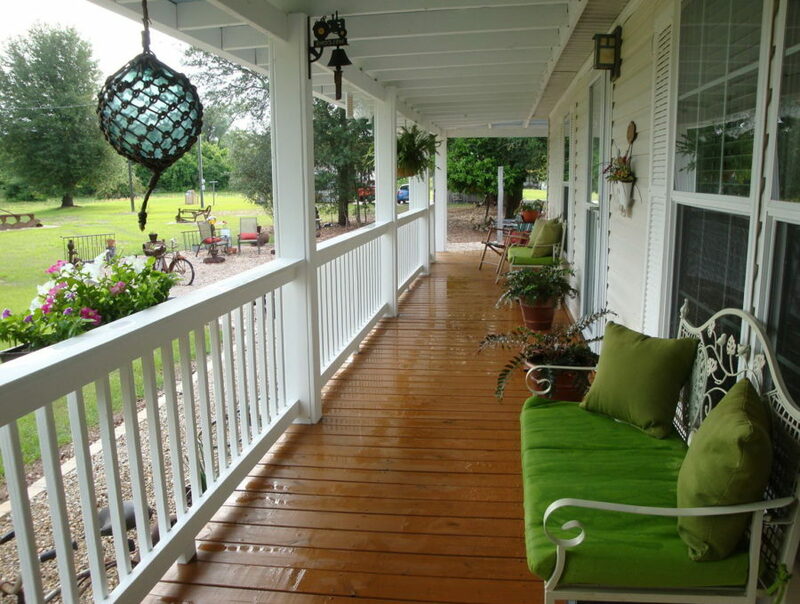 Extra lush greenery and some rocking chairs to accent the swing, it’s truly all you need to make a dream right outside your backdoor. If you’d rather go lighter and brighter, then check out this swing-inspired space! 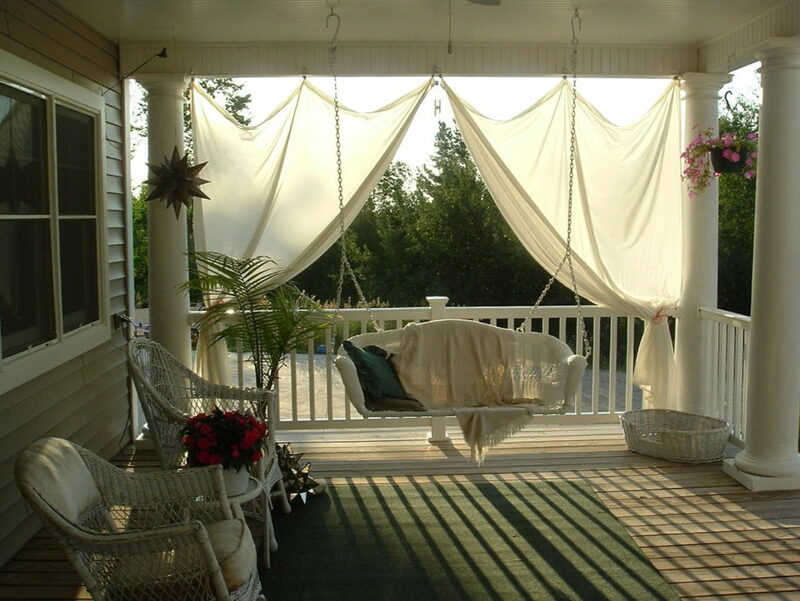 Minimal and romantic, all you need is some wicker furniture and a bit of fabric to recreate this in your backyard. A throw pillow and blanket or two wouldn’t hurt either. It’ll become your favorite part of your home, a space to take afternoon naps or catch up on your reading. 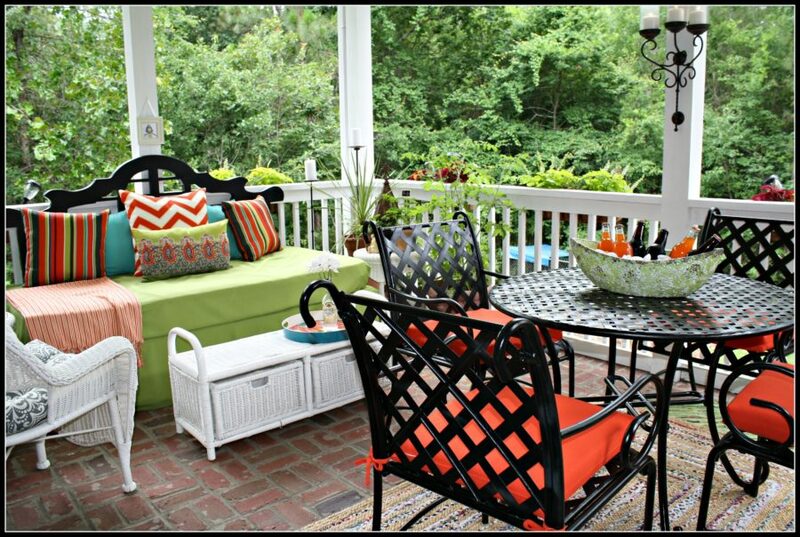 Southern State of Mind created a back porch area with simplicity, ease and a bit of color too. It’s the perfect kind of space for entertaining the family – as well as the friends – while not giving anyone too much fuss either. Some potted plants to add warmth and some twinkle lights for summertime nights, there’s not much to this design. Finally, over at Worthing Court, you’ll find another traditional setup to become inspired by. There’s ample seating area, a section to enjoy evening meals and enough greenery to create a serenity and simplicity all in one. Neutrals keep with that cozy, easy feel as well without creating too much interest or kitschy chaos.